Donald Ray Wilson was born in Haskell, Oklahoma, in 1933. His father and mother, Ted and Bea Wilson, were baptized into Christ just prior to Don's birth, so he was "raised in the church of Christ." His family, including brothers Vern and Clyde (also gospel preachers), lived in Oklahoma until the start of the Second World War, then moved to California for work. During the next 7 or 8 years the family moved back and forth between California and Oklahoma, so that Don went to a dozen different schools before graduating from high school in Sunnyvale, California, in 1951. His family, along with several others, started the church in Sunnyvale. Vern, Don, and Clyde got a lot of preaching experience before they were out of high school. Starting college at San Jose State, Don determined before the first year was finished that he wanted to preach the gospel. In 1952, Vern and Don went back to Oklahoma to try to find churches that would allow them to hone their skills with practical experience. Vern found a place in northern Arkansas, and Don started preaching "full time" for the church in Porter, Oklahoma, for "room and board," in the spring of 1952. In June of 1952, he married his California sweetheart, Edna Jo Ann Wilson. They could not live on the "room and board" salary at Porter, so moved to Checotah, Oklahoma. Realizing how little he knew, in 1954, Don and Jo Ann moved to Bartlesville to attend Oklahoma Christian College. After one frustrating year, he got an invitation to return to preach in California, where he has made his residence ever since. Don and Jo Ann have three grown children, all faithful Christians, and (at this time) six grandchildren. Don has preached for churches all over California, Oregon, Washington, and several other states. 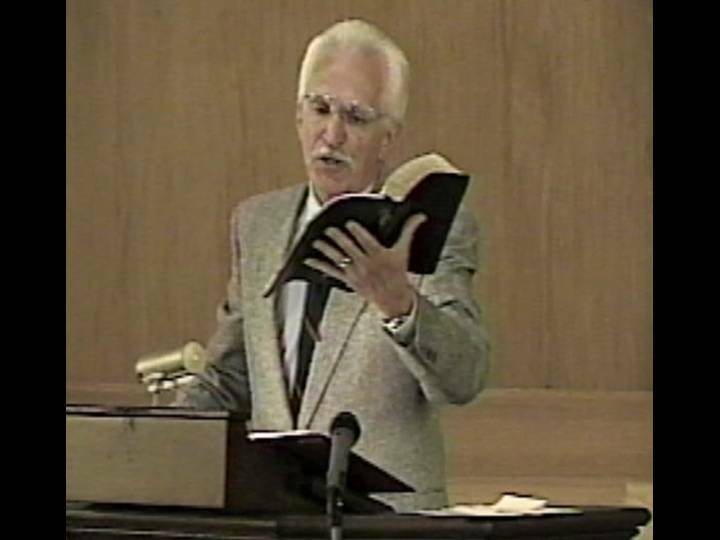 In 1983, he started making month-long trips to the Philippines to teach preachers' classes, which he continued for 20 years. He has also made trips to preach and teach in Mexico and El Salvador. In the last thirty years, he has served as an elder in three different churches. He is presently serving as one of the elders and one of the preachers in Loomis, California. Don has participated in more than a dozen public debates and moderated for many more. Baptists, Seventh Day Adventists, Mormons, and the Pentecostal Holiness groups from outside the body of Christ, as well as Christians from the Institutional, One-Cup, and No-class persuasions have all felt the force of his logic. Don considers his debate with the Baptist Dr. Lawrence Crawford (available from Truth On Disc) to be his best effort. At the time of this writing, May, 2004, Don is seventy years old and still very healthy and active. He and Jo Ann, married over 50 years, are planning another trip to Mexico at the end of this month. He also plans to return with Raymond Gonzalez to Mexico and El Salvador in the near future, if the Lord permits.